I'm laying down on a yoga mat, eyes closed, a meditation cushion under my knees, and my body resonating with the vibrations of a huge gong and varied pitches of Tibetan Singing bowls. And I'm not dreaming. I'm at Taurus Moon gallery in Julian, California - three nights ago. I'll back up. A couple of months ago I got a call from a refreshingly enthusiastic, young woman who told me she had seen my fused glass jewelry at a shop a while back. She told me she wanted to carry some of my pieces in her soon-to-be-opening gallery, Taurus Moon, in Julian, CA. Kimberlee told me her vision was to create a small gallery and boutique to "nurture the soul and feed the spirit." Well, let's just say that after meeting Kimberlee, her husband Rex, and their sweet dog, Taj, it was an easy decision. Taurus Moon has been opened for two months. It's a small, stand-alone space with hot pink exterior accents and is full of beauty and love. In just the short time they've been opened, they have held two very cool events, the New Moon Circle in honor of the solar eclipse last month, and the Tibetan Singing Bowls and Gong Meditation last Friday evening. The sounds created by Tibetan singing bowls have been proven to resonate at frequencies corresponding to the seven chakras in the body, align them for better health, increased focus, and relaxation. Sound healing is an effective and proven modality that uses vibrational sound to help reduce stress, alter consciousness, create a deep sense of peace, and to help treat all kinds of diseases and disorders. How does it work? 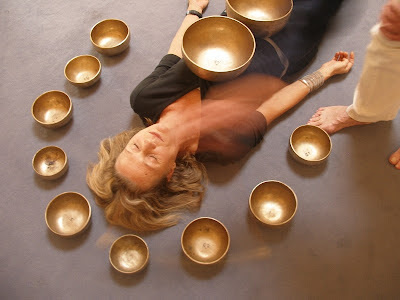 Tibetan singing bowls are struck in specific rhythmic patterns to create vibrational sound harmonics at the frequency of "AUM" (also written as "OHM" or "OM"). This sound frequency impacts the sympathetic nervous system as the brain waves synchronize to the vibrations of the bowls. The harmonic vibrations engage the relaxation reflex and slow down the respiratory, brain, and heart rates and disrupt the pain reflex, thus creating a deep sense of well being. Deep Deoja took over the intimate space of Taurus Moon and after giving us a more thorough explanation of the meditation, he led the 10 of us (max capacity!) through a brief chakra mindfulness meditation. He then invited us to lie down (with our heads oriented toward the middle of the room), close our eyes, listen, and accept whatever happens. At times I felt I was in a sci-fi movie where time and sound was moving in and out. It was soothing, deep, powerful, startling, and mesmerizing all at once! It's really hard to explain, and I guess I would just say that if you have the opportunity, go for it! Oh my gosh, yes. LOVE her! She infuses that sweet little place with her light.